The mulberry is a deciduous tree, which in Japan grows both wild and under cultivation. Mulberry leaves were widely known for their being the food of the ‘silkworm’, which is actually the caterpillar of a domesticated moth with the scientific name of ‘Bombyx mori.’ Silk, which was first produced in China about 5000 years ago, is produced from the pupa case of the moth. 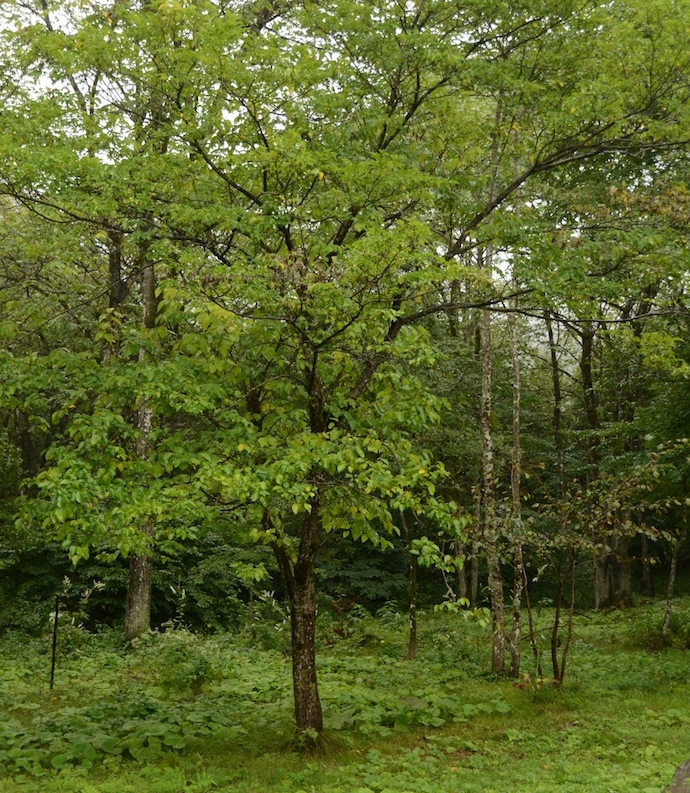 In our ‘Afan’ woods here in northern Nagano, we have lots of wild mulberry trees, which we know more for their delicious, sweet fruit. Our mulberry fruits are black when ripe, red when unripe. Bears and children love the black ones, but be careful not to get the juice on your clothes! It can stain a white shirt a beautiful purple-black. For furniture, only wild trees are used, and wild mulberry trees can grow to be 500 years or more. They grow very quickly when young, and then very slowly, which makes for the fine grain. In Europe mulberry was favoured as a rare and expensive veneer. Nowadays mulberry wood is finding more popularity in North America in upscale furniture markets. 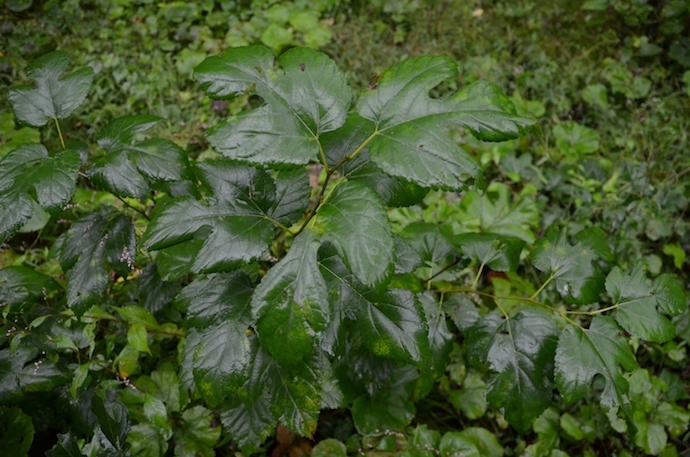 Mulberry leaves are also well known in Chinese herbal medicine, used to treat diabetes and for weight loss. Maybe I should try it sometime? When I have time I gather ripe mulberry fruit, add a little black sugar, and cover them in a jar filled with shochu or Okinawan awamori, leaving them for at least a few months. This drink is great with sparkling soda water or mixed in cocktails. 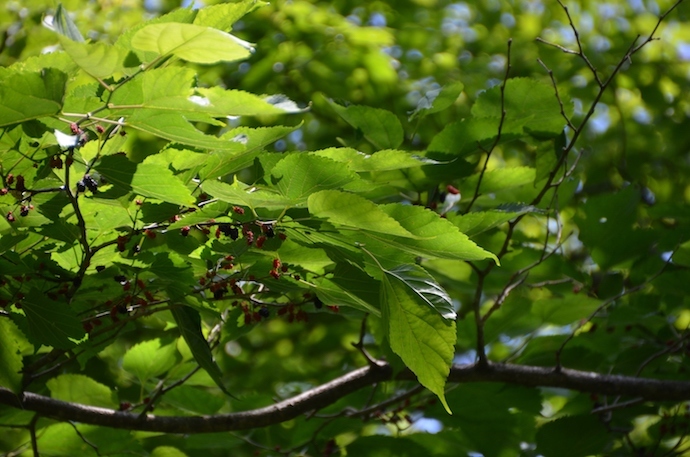 Like so many other trees, especially fruit, nut or acorn producing hardwoods, the mulberry has been dismissed by the main Japanese forest industry as a useless ‘zatsu boku’ but nothing could be farther from the truth. The mulberry is a very valuable tree. If you don’t believe me, ask the bears!